49 seat vintage Leyland Leopard for wedding and event hire. A magnificent 1968 single deck bus available for weddings, proms, birthdays or any other celebratory event. 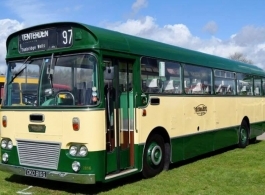 Finished in Green & Cream, this vintage bus will cover Brighton, Lewes, Eastbourne and the majority of East Sussex.